In fact, nearly all schools look much the same today as they did fifty years ago. Even after waves of reform, including class-size reductions, new curricula, the introduction of forms of school choice, and the implementation of standards and accountability mechanisms through No Child Left Behind (NCLB), the basic structure of education is unchanged. Despite huge advances in computing and communications in other sectors, the core technology of education has remained virtually intact: schools are dominated by a cadre of teachers who guide a group of same-aged children through curricula delivered in nine-month segments. 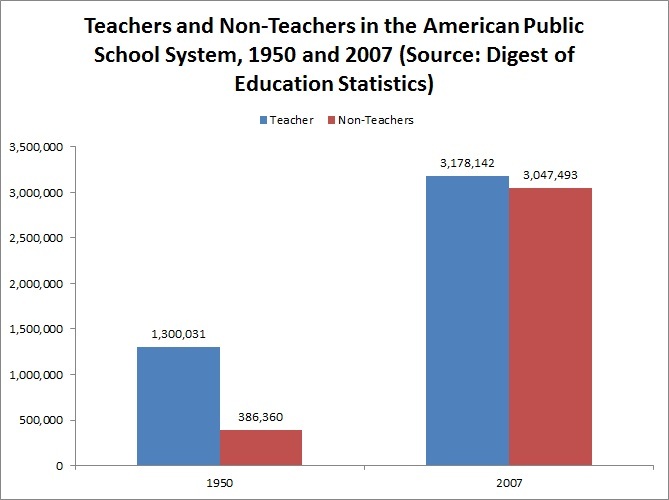 Schools are highly labor intensive and getting more so, due to pressures for class size reduction and increasing use of specialist teachers. 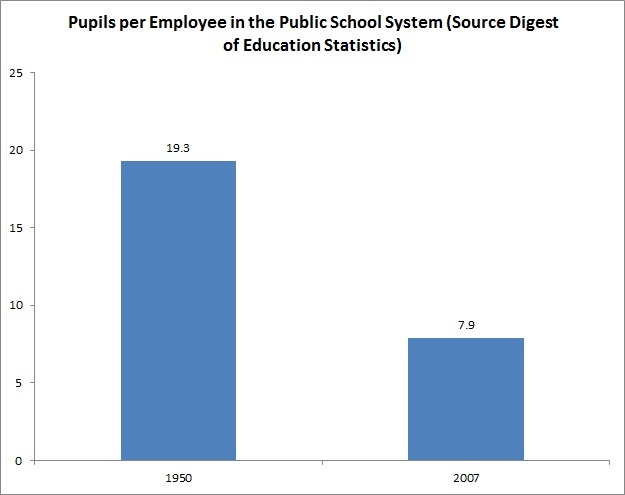 Yet on average schools are producing at best only slightly better results than at earlier times; thus, given increased costs, they are literally becoming less productive. Is this inevitable? Some claim so, due to Baumol’s disease: the tendency of labor-intensive organizations to become more expensive over time but not any more productive. In the 1960s, economist William Baumol observed that productivity (deﬁned as the quantity of product per dollar expended) in the labor-intensive services sector lags behind manufacturing. Because labor-intensive services must compete with other parts of the economy for workers, yet cannot cut staﬃng without reducing output, costs rise constantly. This phenomenon, of rising costs without commensurate increases in output, has been labeled Baumol’s cost disease. Baumol’s prime exemplar was the string quartet, which produces the same music from the time it is ﬁrst assembled until the players all retire, yet experiences higher costs as the players receive salary increases to keep up with the wages earned by others. There are compelling indicators that K–12 education suﬀers from the same disease. The combination of rising costs and stagnant productivity are major problems in an environment where many children are not learning the skills they need and education is now not likely to receive sustained increases in public funding. During this period, we saw only very small academic gains for students. 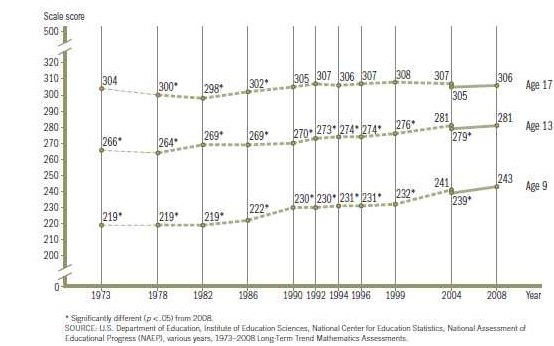 The above chart is the NAEP long term mathematics trend data. Notice especially that 17 year olds show a two point gain on a 500 scale point test since 1973 despite the vast increase in spending and staffing. Hill and Rosa have ideas about how to combat Baumol’s disease in public education, and it is well worth your time to read. I have some ideas of my own, but I’ve likely already exceeded your wonk-tolerance threshold for a single blog post, so tune in next episode for a discussion of solutions. Dr. Matthew Ladner is the Senior Advisor of Policy and Research for the Foundation for Excellence in Education. He previously served as Vice President of Research at Goldwater Institute. Prior to joining Goldwater, Ladner was director of state projects at the Alliance for School Choice. Ladner has written numerous studies on school choice, charter schools and special education reform and coauthored Report Card on American Education: Ranking State K-12 Performance, Progress and Reform for the American Legislative Exchange Council. I had never heard of Baumol’s disease – it’s very helpful. Thanks for writing this post and for the link to the Hill and Rosa study.